I'VE seen some truly ridiculous pitches in my time on Dragons' Den Online - and last week was no exception. Our internet spin-off of the original series, which made its BBC2 debut on Wednesday, was designed to see entrepreneurs' business pitches in their rawest state... and some are pretty raw! A classic example was the hilarious Hills brothers, who pitched their idea for the M Pod - short for Motorway Pod. The product had been designed to "protect your dignity" when you break down on the motorway. The clip featured a broken-down car and two guys climbing into and sitting down in what can only be described as a big yellow cagoule. There's certainly no shortage of awful propositions that have no chance of receiving any sort of investment. But a lot of the ideas we see HAVE been good. And watching the show last week had me reflecting on what makes a great investment opportunity. One of my favourite investments has been in discount retailer boffer.co.uk, which sells one heavily discounted product a day. Boffer is a great example of a business that has developed during the downturn by offering cash-starved consumers better value for their money. Consumer trends show that people are now avoiding the High Street and looking for a better deal online. Boffer has captured this growing market by offering products - including laptops, MP3 players, digital cameras and LCD televisions - at a fraction of the High Street price. The majority of its products are end-of-line, providing retailers with the ideal vehicle to liquidate excess stock. The site continues to grow and now has over 80,000 registered members logging in every evening at midnight to check out the latest deal. Companies have to think outside the box during these tough times and the management team has to be applauded for giving consumers what they want. As an entrepreneur and venture capitalist, I have the instinct for a deal but I always start by asking myself if I like and would be able to work with a person. One of the main reasons I got involved in Boffer was the management team - their creative energy and determination to be a success was infectious and I knew I had to work with them. I look for someone who is serious about their business - someone who is driven, and who inspires me with a great idea. You have to be willing to put in the hard work and dedicate over 50 hours a week to successfully launch a start-up. A couple were featured on the show last week hoping to secure investment to take a baby cosy product to market. However, they admitted that they only spent a few hours a week on their business. How could they have seriously expected Julie or I to invest our time and capital in the business when they displayed so little commitment themselves? I don't tend to invest in a lifestyle business either - it has to be high-growth and one that allows me to realise a quick and significant return on my initial investment. I now also want a lot more equity before I invest. Perhaps I would have settled for ten per cent a year ago but now I want at least 30 per cent. It's also important that you've already done your market research and have the back-up to convince me that there is a significant demand for your product or services. But crucially you have to have integrity, know what you are talking about and know your numbers inside out. Do that and I may just be in. 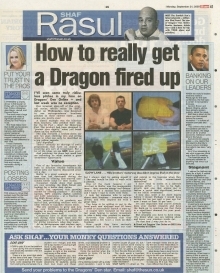 Check out Dragons' Den Online on BBC2 this Wednesday at 9.30pm.